1 of 1 Heat oven to 350 degrees F. Line indents of a standard-size 12-cup muffin pan with cupcake liners. 1 of 3 In medium-size bowl, combine flour, cocoa powder, baking soda and salt. 2 of 3 In large bowl, with mixer on medium-high speed, beat butter and sugar until smooth and creamy, 2 minutes. Beat in eggs and vanilla until fluffy, 1 minute. On low speed, beat in flour mixture alternately with milk, beginning and ending with flour mixture. 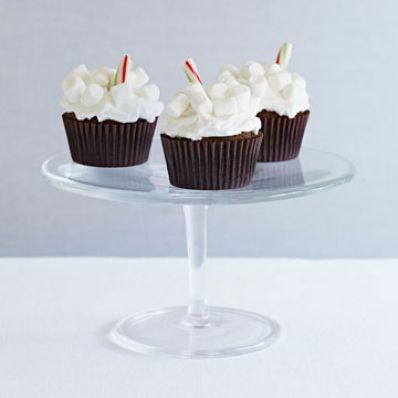 Fill each cupcake liner two-thirds full (about 3 tablespoons of batter per liner). 3 of 3 Bake at 350 degrees F for 25 minutes or until toothpick inserted in centers comes out clean. Remove cupcakes from pan to wire rack; let cool. 1 of 1 In medium-size bowl, with mixer on low speed, beat confectioners' sugar, shortening and milk or water until smooth. Spread over cupcakes, about 2 tablespoons for each. Top each cupcake with 8 or 9 mini marshmallows. With a serrated knife, cut wrapped candy canes into 2-inch pieces. Unwrap and tuck a piece into each cupcake.